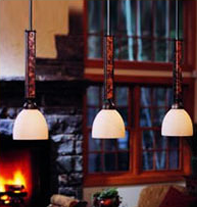 Here are a few design tips to keep in mind when choosing a fixture for your design project. If your question isn't answered here, feel free to call our Vermont order desk at 802-446-2400 for more help on your design problems. We're experienced design professionals and are here to help. Q: HOW HIGH SHOULD MY CHANDELIER HANG ABOVE MY TABLE? 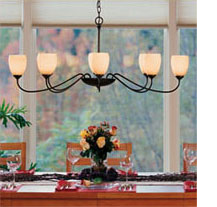 A: The industry average for the height of a chandelier is 30" above the table. Some larger chandeliers may look better if hung a bit higher especially if the ceiling is high or the scale of the room is large and open to other rooms. Q: UP LIGHTS, OR DOWN LIGHTS? WHICH ARE BETTER? 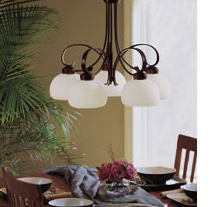 A: In a formal dining room that's only used for meals, up-lights are fine. If you plan on using the table for tasks like reading the paper, kids doing homework or crafts, you might want to consider down-lights. They'll provide much better task lighting when you need it. Q: HOW HIGH SHOULD MY PENDANTS HANG OVER MY KITCHEN ISLAND? A: The industry average again is 30" from the counter to the bottom of the glass. Over a 42" breakfast bar, you might want to go a little higher. If you also have a view or seating on one side, having the lights a bit higher will be less of a distraction. Q: HOW TALL SHOULD A FLOOR READING LAMP BE? 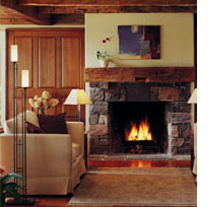 A: Most floor lamps are 58" tall to the top of the shade. If you have very tall ceilings, you might want to go for 60" to 62" tall so the scale of the lamp works with the scale of your room. You don't want the piece to be lost. Q: ARE ALL SCONCES OKAY FOR STAIRWAYS? A: Most of Hubbardton Forge sconces will be fine for stairs. You might want to keep in mind projections from the wall. 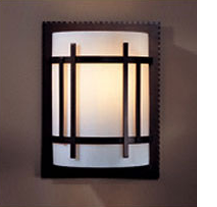 ADA compliant sconces have only a 4" projection and are excellent for stairways and halls.